Between Netflix binges and dinners on the sofa, we spend a lot of time in our living rooms. They’re a gathering space, a place for relaxation, and often the focal point of any home—so if there’s one room worthy of a little decor TLC, it’s this one. And if your living room happens to be the one on your renovation to-do list for the New Year, we have plenty of inspo for you. Between globally inspired spaces that anyone with a thing for antiques will love and more sleek, contemporary rooms, we’ve seen our fair share of cool living rooms this year in the homes that we’ve featured. Here are some of the highlights. This particular living room might actually be an office, but Jesse Kamm’s L.A. space is nothing short of minimalist perfection. Natural materials and a neutral palette can make even a workspace feel relaxing. Designer Melanie Burstin’s L.A. home is only 650 square feet—but the zen space is anything but cramped or cluttered. If you, too, are dealing with a smaller living room, sticking to clean lines and minimal decor will help keep it from feeling claustrophobic. On the opposite end of the size spectrum sits this living room, part of an open common area in Kate Zimmerman’s Texas vacation home. 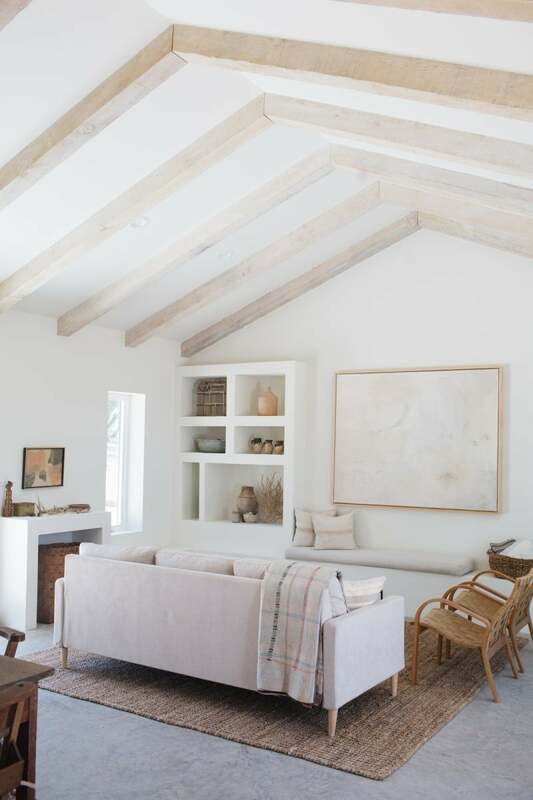 A preponderance of lighter woods and whitewashed built-ins make for the perfect minimalist backdrop for Zimmerman’s carefully curated, soft-toned decor. Bold color palette aside (the idea of painting the door and built-in shelving to match the wall is genius), we also love St. Frank founder Christina Bryant’s home for its eclectic assortment of textiles and tchotchkes. Proof that you can be a maximalist without having to paint over your white walls—great news for any renters out there fearing for their security deposit. Erin Walsh’s Brooklyn home focuses instead on bringing colors and prints to the accent pieces; the whitewashed walls allow for more creativity with bold graphics and splashy hues. Red may be the color of the moment, but it still carries a stigma when it comes to ease of implementation. This Palm Springs home is a lesson in decorating with vibrant colors that somehow don’t clash—the key is keeping elements of the primary color (in this case, red) scattered around in small doses. Beyond the accent wall, the hue features in the sofa, the art, and even the books on display. There’s so much pattern in Annabel Mehran’s L.A. home that it shouldn’t work, but it does, brilliantly. This is because she kept the larger pieces (like the marigold yellow sofa) a simple solid color and tied in dominant hues from the accent pieces (like the blues) in the paint. This Laguna Beach home is chock-full of carefully collected pieces, and you get a good snapshot of them in the tiny living room. The more traditional style feels homey—there’s nothing too over the top, allowing the pared-back accents to steal the show. Emily Farnham’s bungalow is a modern take on rustic style. More contemporary colors balanced out by artwork collected over the years, cozy textiles, and charming finishing touches are a great balance of old and new. It may look minimal, but the punchy colors in this living room immediately hike up the visual interest. Play up a contemporary design sensibility in your space by choosing sleek pieces in bold hues. Stylist Miranda Starcevic’s Brooklyn apartment is full of unexpected, funky touches—essentially the opposite of traditional “French-girl style,” but we love the modern yet playful sensibility. Don’t shy away from colors (try a tonal palette, when in doubt) and opt for more abstract artwork to mimic Starcevic’s fun aesthetic. Timothy Goodman is a graphic designer, so it makes sense that his NYC studio is just as colorful and cool as his work. The living room is peak colorful minimalist, with bright, primary colors providing tons of contrast against the clean lines of the furniture. When you have an electric blue loveseat and citron yellow sofa in your living room, you might want to keep the rest of your space pared-back to avoid it veering into eclectic maximalism. The contemporary space is one of our favorite parts of this tiny San Francisco home. 100 Layer Cake founder Amanda Dawbarn was inspired by her travels to Italy and Greece—and the minimal Mediterranean aesthetic is definitely reflected in her calming Playa Del Rey home. A neutral palette and bohemian accents help marry a globally inspired aesthetic with the breezy California vibe of Dawbarn’s surrounding area. If you’re a flea market fiend, you’ll love Amhalise Morgan’s stunning Brooklyn home. The whole house is decked out in cool antique finds sourced from her life and travels around the world; it definitely makes the case for taking your time and decorating intentionally. The inspiration behind this Los Angeles home was “Spanish glam meets California cool,” and you definitely see both influences in the gorgeous living room. A mixture of more contemporary finds, like the pink velvet couch and brassy accents, and old-school charm, like the tiling and antique rug, make for quite an interesting space.